What is your personal dress style? It is very difficult now a day to label styles. Consequently, because with art it is only but a matter of time before we can keep it in a box. Art genres within their current (“contemporary”) states begin to evolve and further develop from their preceding styles. An example of this is the infamous Monet’s 19th century Impressionism painting style which influences the likes of Signac and Seurat in creating an evolution-ized form of Impressionism called Pointillism (or also known as Neo-Impressionism). However, being the psychological beings that we are, we must still place things in categories or “boxes” in order to be able to make sense of them for ourselves and to others. Therefore, we at TEF have taken the liberty to label these “boxes” for our readers into three separate categories of dress style; Classic, Prep and Street. 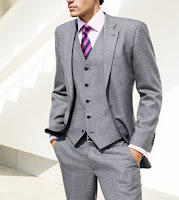 The first style of dress that we would like to begin with is the most formal of the three; Classic. Classic is exactly what we think of at the sound of the word; classical, elegant, super-formal, old style, “old skool”, Beethoven, Mozart and lastly “fad-proof”. For the many of us who have not been to etiquette school, classic dress style is what we would consider job interview apparel or the uniform of Corporate America. 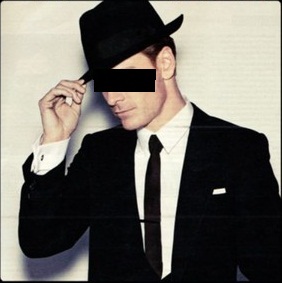 Classical dress entails a collared button down shirt, tie, double breasted to a three or four button suit blazers with matching pants, an optional waist coat, hard bottom laced shoes, accompanied with an overcoat (trench coat) and fedora (not to be confused with today’s commonly sported rendition of a fedora, the trilby hat; a type of fedora). Prior to the Industrial Revolution, when denim was first introduced and solely appropriate for working on the rail, all men and boys were expected to dress in the aforementioned manner whether they were going to work, school or not; there were no other options. At a point in time, not as much today, even the color of the suits, shirts (the collar’s cut) and ties were limited to certain colors in order to be considered business appropriate. This was just the way of life. But as we discussed previously, art styles evolve. When people began to realize that this kind of dress style was not comfortable for all activities of daily life is when various options of clothing arose to accommodate theses activities and events. Examples of these creations were: denim (overalls), (tennis) sneakers, polo shirts, khaki pants, golf jackets, and other types of head gear aside from the commonly used fedora or homburg hat. This classic style of dress has become somewhat more lenient throughout the years as taking fashion risks has become more prominent. The core rules and elements to classic dress seem to have been slightly disregarded. 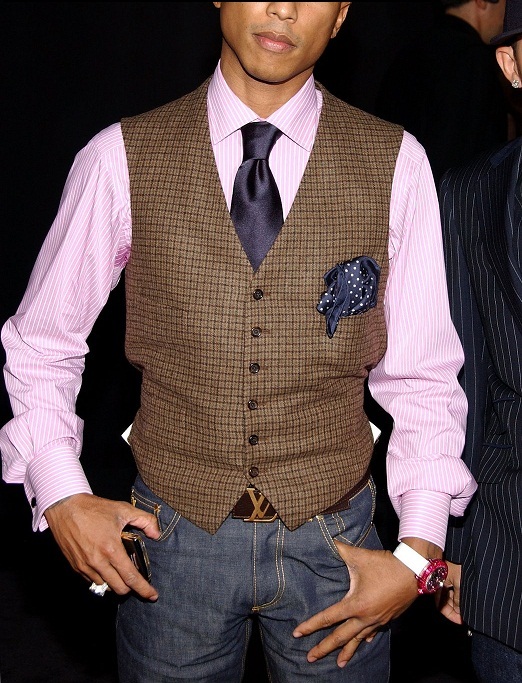 Less and less men are dressing classic in the post-twentieth century and it shows when there’s a poor acknowledgment for composition, look or even overall fit. Once different options arose, it became easy to forget the usual and mundane. People, nowadays, want to praise the lack of sartorial strictness and rules. In turn, many men steer clear of a classical dress style due to either never being taught, its perception of sartorial confinement or sporting a suit seeming pretentious. Nonetheless, we encourage men to disregard what others think and try it; go to a tailor/suit rental store (Menswear House or a friend), get your suit measurements and have fun with it. There are no real rules just be mindful of the suit's fit (go for more fitted rather than baggy look), and see if you do not feel, see or even receive different attention. We triple dog dare you! The second style of dress that we would like to ad-dress (ha!) is the most lenient with regard to styling rules which is; Street or Urban wear. Many may argue that Street wear really has no rules to its style of dress. They will refute that it is not a dress style but rather more of a lifestyle. Albeit it a style of dress or lifestyle it does resonate a certain look; and we would like to examine the history of this look. We had mentioned before that within art, any given art style within that respective genre may give way to another style within that very genre. However we would also like to add that art does not only influence the evolution of its respective genre; It can also spill over and evolve the style of any given art genre. A common influential relationship between two different art genres has typically been between Music and Fashion; and Street wear is its offspring. Does art imitate life or vice versa? Now it may be difficult to pinpoint which exactly influences which but we at TEF choose to agree that during the Hippie era of the 1960-70’s is when Street wear was born. It was a time when people began to take a stand against War and the Corporate America mindset (along with its style of dress). The stand that was taken was perceived as insubordinate or “against the grain”. There was a new wave of funkadelic-LSD infused music being released with a penchant for love, peace and anti-capitalism and the people who patronized the music highly resembled the people making it. With regard to the Vietnam War draft, capitalism and the Corporate World; hippies boycotted the draft, companies they felt were a result of capitalism and the overall dress style of Corporate America. They wore what they wanted, when they wanted and how they wanted with little to no regard for brands and social stigmas. They wore bell bottoms with skippies or boots, tide-dye shirts, anti-political/war buttons, pendants and other article of clothing displaying the peace sign (or white dove) and bandanas, ropes and floral arrangements as head gear. Men wore their hair long and unkempt as well as their beards. Much of the music eventually fell under different tiers of Rock & Roll and as it continued to evolve in the 80’s and 90’s so did the look of its followers. With Rock & Roll speaking to most white suburban and urban youths there was the birth of yet another music style. 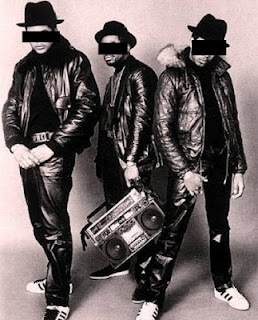 A music style which spoke to the social plight of black urban America which was called Hip Hop. Hip Hop also became recognized as a way of thinking; dress; a way of life; a lifestyle. 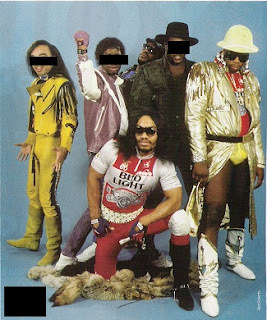 Where there was once a clear split between the sound of Rock & Roll and Hip Hop’s music, there really was not a difference in their style of dress. They were both flamboyant with neon colors, animal and geometrical prints, make-up and overall androgynous look and fit. 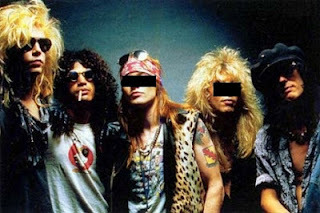 Until the late 80s when Rock & Roll became a bit darker in colors and Hip Hop became more conservative with the androgyny and flashier with jewelry with the rise of cocaine-crack era. The crack era for many marks the onset of drug-dealing, "money getting", misogynist, machismo, “Gansta” Rap. 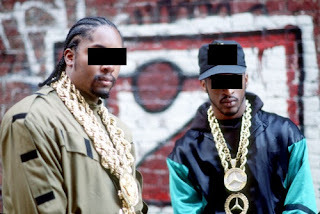 This is was the emergence of love for leather jump suits, baggier clothes (early 90s), name brand sneakers and ostentatious gold chain, earrings (“doorknockers” for women) and five finger rings. At this point there was not only a split between the sounds of Rock and Hip Hop but now also in their looks. However, within the last decade these two cultures have made a “figure eight” and reconnected on some once lost common grounds. We can see the Hip Hop culture reincarnate as it once again has become more colorful, prints influenced and androgynous with its look and fit. It now brandishes Rock/Street-Extreme sports influenced brands that they did not sport before such as Dr. Marten boots, Vans, DC sneakers, Supreme, Stussy and Supra. We also see accessories we have not seen since its birth such as wallet chains, spikes, novelty bracelets, chains and rings. In the Rock/Street-Extreme Sport culture we can see that they are incorporating New Era fitted hats and a more adept taste for exquisite and expensive name brand sneakers. Come to think about it, one would be hard press imitating these dress styles because there is more to them then meets the eye. Hence, why some people may criticize this article for joining the two lifestyles together to begin with. And that is okay because we feel that although the lifestyles maybe have derived somewhat differently the message and look behind it is quite the same; Struggling through social plights. Now for the last, but definitely not least, of the three dress styles is what we at TEF categorize as when one combines the previous two dress styles to form what we like to call: Preppy or Prep. Although what we at TEF define Prep to be is not necessarily what it means, so here goes the history lesson. The word “Preppy” comes from the word “preparatory” as in preparatory high schools. The word Prep, however, became colloquialism commonly used to describe the dress style of particular American high school teenagers referred to as “preps”. However, this style of dress, too, was once considered a lifestyle, a lifestyle which is used to describe the adolescents from America's Northeastern upper-class families who attended preparatory high schools or Ivy League colleges such as Harvard, Yale and Princeton. 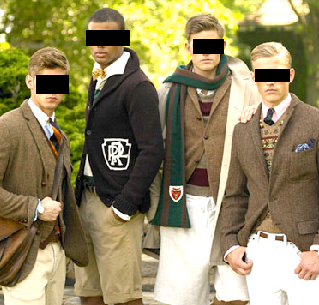 The prep lifestyle, now most commonly seen in movies, is based on three extrinsic desires; popularity amongst their scholastic peers, physical appearance and material possessions. The look which derived in the 1950s consists of argyle and lettermen (cardigan) sweaters, lettermen varsity jackets, chinos, madras, Oxford button down shirts, (penny) loafers and boat shoes. However, growing up in an urban community you were labeled Preppy when you were too dressed up to be called Street yet too dressed down to be called Classic. Its one floor down from business attire, and there seems to be plenty of occupants on this floor today. You may see guys with fitted pants, oxford plaid shirt, vans or brogue shoes and a cardigan or shawl sweater, denim jacket with pin buttons and a tilby hat or possibly a New Era fitted cap. Prep is a happy medium because it can go either way; You can be Prep leaning more towards classic or prep leaning more towards street. It’s all a matter of one or two pieces or accessories which can throw the look into either direction. It’s a fun and easy look because you can play both sides of the field without getting chastised for not being from either of the other two lifestyles. Next Article? "Style Vs Swagger".... What's the difference? Can't tell you now, gotta run, see you in two weeks :)..